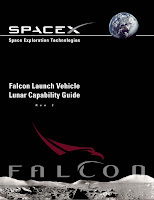 Our friends at SpaceX have passed along word that they've just posted a revised edition of the Falcon Launch Vehicle Lunar Capability Guide. It's not tremendously different than the previous edition, but does feature the most up-to-date statistics for the Falcon family. "The Falcon 1 launch vehicle is capable of injecting up to 420 kg into a 185 km circular orbit. Additional trajectories include a range of highly elliptical orbits for proportionally less payload up to 8000 km as shown in Figure 3‐1. By employing a Falcon 1, a lunar‐bound spacecraft equipped with a kick‐motor is capable of reaching sufficient velocities for Trans Lunar Injection"
"Falcon 1e is capable of putting just over 1000 kg into LEO at 185km circular orbit and proportionally smaller spacecraft into a highly elliptical orbit of altitudes up to 25,000 km. After LEO or HEO insertion, a kick motor on the spacecraft could then provide the necessary delta‐v to complete a Trans Lunar trajectory and ultimately put a payload onto the lunar surface." "When launched from Cape Canaveral, Falcon 9 is capable of inserting roughly 1925 kg into TLI." Using Falcon 1e, only a very small payload of less than 200kg could be delivered to High Earth Orbit (HEO). The kick-motor required to reach Lunar Transfer Orbit (LTO) will take even more mass. Considering that the delta-V to go from to a landing on the moon is of the order of 3km/s, a lot of the remaining mass will need to be propellant, and the tanks for that propellant. GLXP teams should consider that the theoretical dry mass of a lander relying on launch by the Falcon 1e will likely be very small.